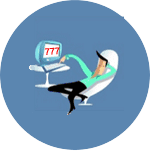 While today’s online casinos deliver authentic action around the clock, the experience doesn’t perfectly mirror a trip to a land-based casino. There are subtleties as well as glaring differences that cause players to prefer one to the other. It doesn’t matter whether you are a casino veteran taking your game online for the first time or are an absolute beginner. We’ll get you up to speed on the differences and similarities that will shape your game. Learn what to expect and discover what’s best for you. Online casinos let you play at any pace you can imagine. Enjoy the flexibility of taking your time without the pressure of a dealer. You definitely won’t find any other players snickering at your every move or mocking you beneath their breath online. At the same time, online casinos let you play as fast as you can click and even multiple tables all at once! Not only can you play at multiple tables at the same time online, but those games don’t have to be all the same. Why not enjoy blackjack, video poker, slots, and roulette all at once? If you’re up for it, you can even visit multiple casinos at once before getting out of bed. The game selection at online casinos tends to be superior to what you’ll find offline. Live casinos see no point in training and staffing dealers for less popular games. Online casinos can afford to offer games even if they are rarely touched since it costs them nothing. You’ll also find a wider range of stakes online, as the casino can create a table on demand at no cost. The online casino market is highly competitive. Anyone of legal age can easily log on to dozens of great casinos with a few clicks. Visiting a live casino takes effort. If you don’t like the vibe, you’ll have to head across town. That’s time consuming and expensive, which means you can either open your wallet or call it a night. Online casinos try to outdo each other with big sign up bonuses that you would never see in a live casino. 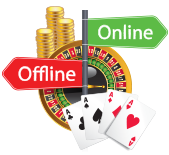 Online players enjoy a wider selection of promotions and special offers than offline players. We all know traditional casinos offer great perks to their most valued players. Yet when you play online even new players can earn rewards and take advantage of great promos. You’ll find more cash back offers, deposit bonuses, and trips up for grabs when you play online. While many live casinos are open around the clock that doesn’t mean you want to head to a sketchy part of town after dark. Maybe there’s no casino nearby. Perhaps it isn’t worth making the trek if you only want to play for ten minutes. Online casinos let you log on 24 hours a day and let you play for as little or long as you wish. You can throw a £5 on black at a roulette table and be done for the night. You might feel pressured to keep gambling at a casino simply because you put so much effort into getting there in the first place. Casino games can be overwhelming for new players. When you play online you’ll be able to refer to tutorials and strategy guides as you play. If you get confused, you can let Google guide you. You’ll be able to keep notes without being hassled like you might at a live casino. Some of the tips and tricks that you can use at a live casino are impossible to pull off online. The popular yet controversial card counting system used to win at black jack can’t be used online. This system requires physical cards and multiple players to work effectively. You’ll need stable internet access and a computer, smartphone, or tablet to play at an online casino. Although most live casinos don’t have formal dress codes, you will need to get dressed. Pants are always optional when you play online. Live gambling in the UK is safe and regulated. When you enter a casino, you can trust that the games are fair and the odds are as posted. If you’re ready to cash in your chips, all you need to do is walk across the room. Things can get murky online if you play on the wrong site. There are hundreds of online casinos that accept players from the UK. Yet only some of them are actually licenced by the UK Gambling Commission. You’ll need to check the credentials before you play.